A kind reader who prefers to remain anonymous sent me some rare nibs and one of them was the holy grail, a Gillott Principality. 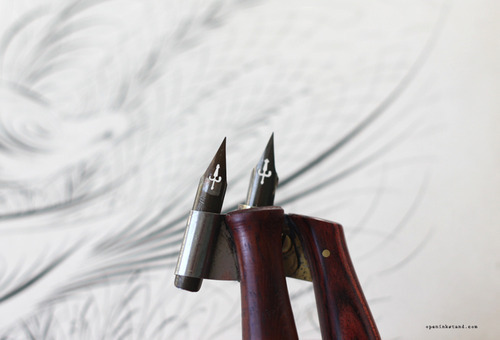 These nibs are considered one of the very best made and very much sought after.. making them very rare and difficult to find, and even then at a ridiculous price. I have never even seen one in person until now. If this nib seems familiar, it is because so many have attempted to clone it. The most famous is of course the Leonardt EF Principal, still in production today and is one of my favorite nibs. 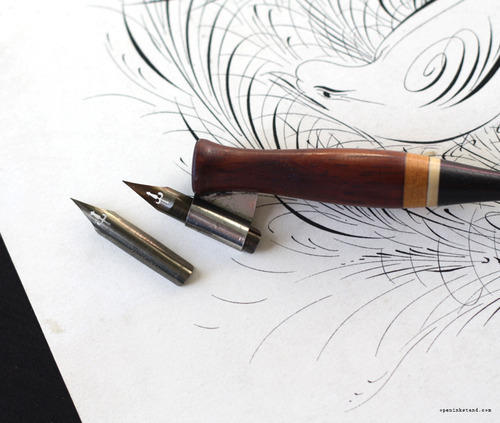 Another is the Hunt 101 by Speedball, another modern and widely available nib. Even other respectable nib makers from the early 20th century attempted to clone it.. the Zanerian Fine Writer or Tamblyn #7, but this guy right here was the original, the one who started it all. I am including some comparisons of the Principality (Gillott, the one in the holder) with the Principal (Leonardt) and you can tell they are very similar, but the most striking difference is the grind on the Principality.. you can see it looks as if someone scrubbed the metal on the eyehole. 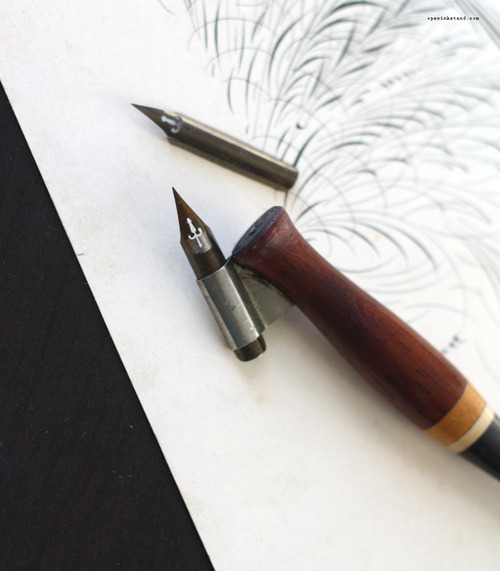 Nibs back then were made manually and was very labor intensive, some even taking up to 10 different steps to complete one nib. 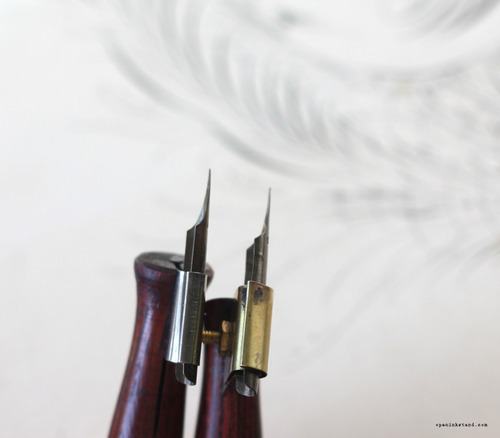 Each nib was tempered, ground, polished, finished and inspected by hand to be completely perfect. They had teams of people working on each process. Nibs these days are simply stamped out on a machine and off they go in the box! Unfortunately the Gillott Principality was in production for only about 20 years. Their scarceness has made then increasingly hard to find for a decent price. But recently Leonardt has come up with the Principal EF which writes just fine.. at $2.25 a nib, it beats having to find the original thing. Below are the comparison shots between the two, the Gillott Principality on left and the Principal EF on the right. Pretty close I think! As I hold the two in my hand, there are some very subtle differences, though they look identical. Other than the design of the manufacturer’s stamps, the eyeholes are a little different.. the Principality’s is a smidgeon smaller. The metal on it feels a little thicker, the slits on the shoulder not as pronounced and maybe I’m crazy here but the Principal looks thinner and sharper. Then again, this may be some unnecessary scrutinizing as of course they won’t be able to get it 100% perfect as the original. As for how it writes? Well those who have tried swore that the Principal is still not as good as the Principality. Don’t ask me though, I have absolutely no plans to use this thing. Seeing how rare and expensive they are, I find no reason to use this precious nib for any reason, and for now it will stay in a pouch safely away from water and ink. Sorry!